I haven’t made 排包 ‘pai pau’ (bread rows) for a very long time. I miss that buttery soft pai pau from Kee Wah Bakery… Hmm, with only two tiny slices of whole wheat bread left on the counter, it’s time to make some more bread!~ Pai pau it is! Little did I realize that my previous pai pau recipes require dough starter which I didn’t have extra time to make… So I used a couple recipes as guideline and create this pai pau recipe that doesn’t use dough starter. 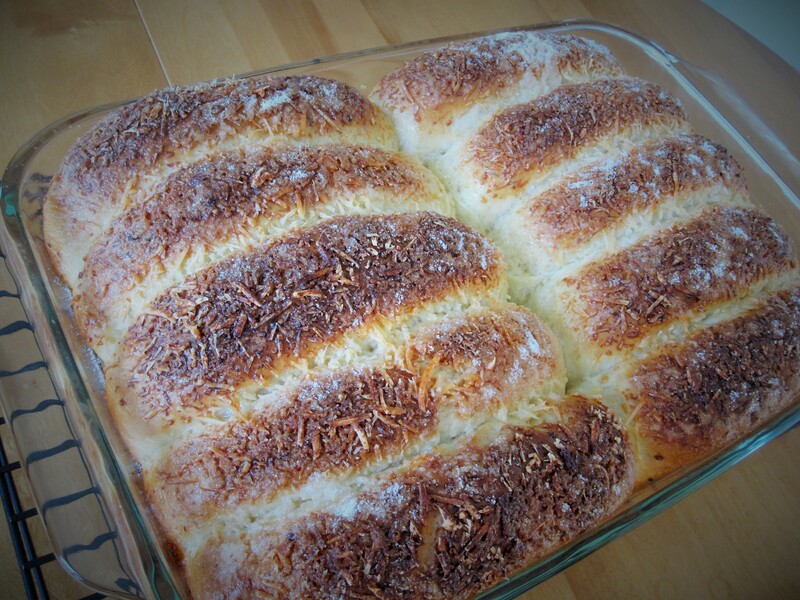 Oh, and I always love Parmesan/Asiago cheese and sugar topping, so why not use it here to clean up my leftover cheese. Add milk and beaten egg to the bottom of bread maker loaf pan, followed by bread flour, ensuring covering all the liquid. Make a indentation in the center and add dry yeast to the indentation. Place sugar, cheese, milk powder, salt and butter in different corners (salt and sugar at opposite side). Select “Dough” course and press “Start”. When the machine starts kneading, check on the dough by touching– if it looks a bit dry and crumbly, add 1 tbsp of milk. If it’s too wet add 1 tbsp bread flour. When the course finishes, remove dough from loaf pan and place in a large bowl, covered with plastic wrap and rest in a warm place until double in size. Punch out the air and kneed to a log shape. Cut into 10 pieces, roll each piece of dough into a oblong shape, sprinkle some sugar (optional) and roll up lengthwise likes jelly roll. Pinch to seal the end. Place bread dough in a greased deep dish rectangle baking pan, slight apart from each other. Cover with plastic wrap and rest until they are double in height. Apply egg wash on top of the bread, then sprinkle some Parmesan cheese, followed by sugar (sugar helps preventing the cheese from getting burnt). Bake for 25 minutes, until the top is golden brown. Remove pai pau from the pan and cool completely on a rack. Milk: Weather and different batch of bread flour affect the amount of liquid used. When the machine starts kneading, check the dough by touching: if it’s a bit dry/dense/crumbly, add 1 more tbsp milk. It it’s too wet/sticky, add 1 more tbsp bread flour. Measuring bread flour: the best and most accurate way is to measure by weight. If you measure by volume, be sure to scoop loosen flour into measurement cup (make a heap), then scrap off the extras with the back of a knife.